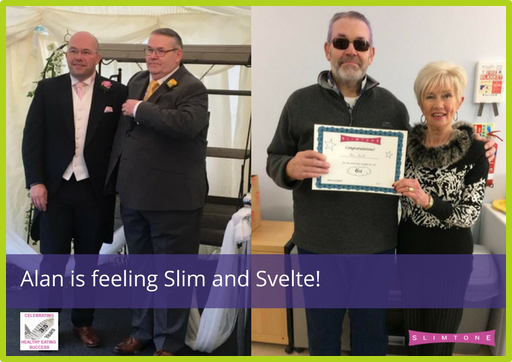 “I recently received my ‘6 stones lost’ certificate from Marie – a loss achieved because I re-joined Slimtone in November 2016 – and people asked if there were some before and after photos to show where I’d come from to where I am now! Well here they are. The before photo is of me at the wedding of my son David to his wife Erin on 3rd September 2016. It was seeing myself in these wedding photos that spurred me on to do something to deal with my obesity – for so many reasons, not least, due to health issues. So I started my weight loss journey tipping the scales at just under 24 stones. I am now just over 17 stones. I also started with a 54″ waist and here I am 15 months later and six stones lighter wearing 38″ skinny jeans! NEVER in my life before have I worn skinny jeans – and they feel so good. With just about ½ stone left till I get to target (at about 16½ stones) and a hoped for waistline of about 36″! As well as feeling so much healthier, I have to add that my self-confidence and self-esteem is higher than it has ever been. I’m ready to make the most of life and live it very much to the full and out in the fast lane, taking every opportunity to enjoy life and all it has in store for me! In a couple of months’ time I shall be 69 years old – but age is very much just a number ’cause this kid ‘aint anywhere near that age inside, still just a young man who’ll make the very most the years ahead! I will add that it hasn’t always been easy, in fact at times it’s been downright hard work, but all of the hard work has paid off and I’m so happy that I stuck at it! Alan has just reached his target weight and I’ve now presented him with his 7 stones lost certificate – well done Alan!